Treze Sortudo (Lucky 13) was our 13th robot and our 13th year of FIRST competition. The robot was designed to collect tubes from the floor and quickly return to score them on any of the rungs of the scoring pegs. The arm was articulated to stay within the required physical dimensions in all playing modes. The “end game” required launching a mini-bot to climb a 10′ pole at the end of the match. The mini-bot evolved during the season and reduced in speed from 10 seconds to about 2 seconds. 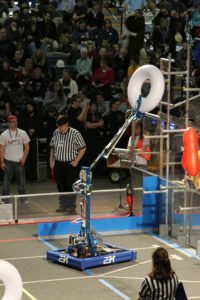 The robot continued to improve throughout the season. Robust, durable, maneuverable, long stretching arm. Waiting, waiting, waiting while the mini-bot climbed to the top!